What is Doitrei? It's from Romanian Language which mean two three. Ha!! This is a really great project to make with those scraps you keep for 'someday I use it' . 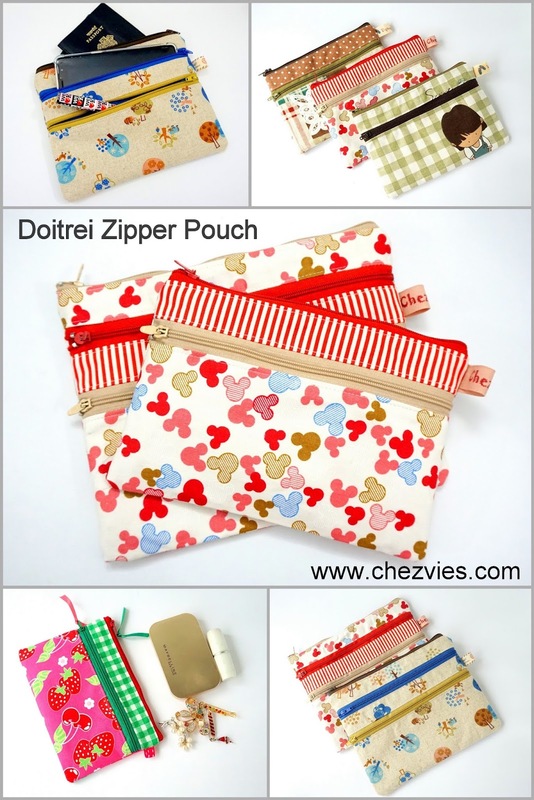 Like this strawberry double zipper pouch. The fabrics are from this patchwork pillow and when I made them into this cute patchwork little pouch , I just loved it!! This will surely make a great gift for anyone in your family. As suggested by my dear friend, Maria, I included pattern templates too.The pattern is now on 20% off both in my ETSY SHOP and WEBSHOP. Don't forget to use hashtag #chezviespatterns when you're posting in Instagram or facebook, so that I can find you! Who needs a personal tailor? !! The Hobby Harbor !! Cherrywood Fabrics Van Gogh challenge - a finish! Block Sixteen, Mariner 24 Draws MMDQ to a Close! When my SEWing began.......Super Fun! "One Yard Wonders, One Day at a Time"